Relieve tension and release the stress with these reclining office chairs! Long hours sitting in an office can affect muscles and circulation in the back and legs. Changing positions frequently, even if only briefly, can make your day less stressful and more productive. This rich looking office chair recliner is designed to do just that. Features include: sturdy 1 1/4" round steel frame, gas lift seat height adjustment, manual pull out or hide away foot rest, five separate reclining chair positions (all the way back to a 45° angle), 4" thick seat and 3" thick back for extra comfort, 27" polyurethane base, fully vinyl-covered back, 2" thick built in headrest and your choice of rich black or burgundy vinyl. These reclining office chairs also meet or exceed all ANSI/BIFMA safety standards. Additional options include soft wheel casters for hardwood/tile floors or floor glides which keep the chair stationary and do not allow it to roll. Dimensions: Back Size: 22"W x 28"H. Seat Size: 23"W x 20"D. Seat Height: 18"-22". Overall: 43" - 47"H x 29"W x 30"D. Weight: 50 lbs. Limited lifetime warranty from OFM. 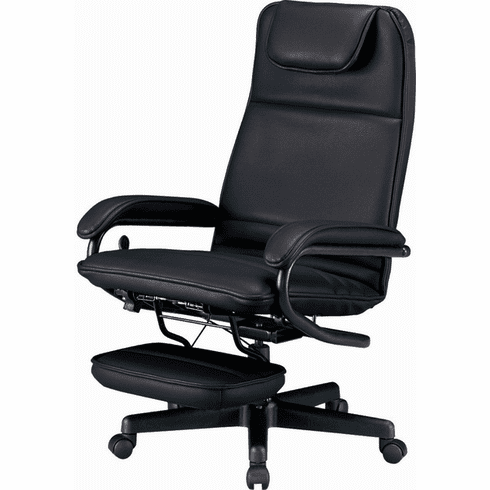 This reclining office chair normally ships within 1-2 business days from our NC or AZ warehouse.